Hilarious! None of us need the reminder. Just putting on a swimsuit each summer is all the reminder I need. 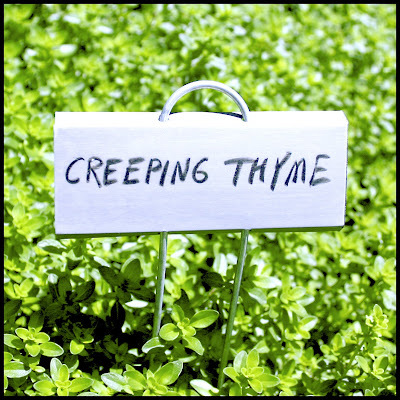 Don't you just wish you could stop thyme just for a little while? Ok, maybe for a long while? A subtle reminder to live fully, right now! Spreading Thighs, oops, I mean Thyme, my favorite...ambitious Thyme. Y'all are so funny! It IS a great sign, courtesy of Blue Moon Gardens. First thing I saw after walked in. And Jaime - stopping thyme is kinda like "saving thyme in a bottle", and we can do THAT, anyway. i smiled when i saw this little photo. because of the double entendre of course. because i can never seem to get my thyme to last more than 2 seasons. the other creeping time is of a darker nature and at the moment can't bare to think about it. Robin - thank you! I'm working on a painting right now , which I hope to be the first of a series, of a robin. A very special robin. You have very good timing.